June 20th marked the tenth anniversary of the day I began exploring Nebraska for what would eventually become ninety-three. To commemorate the anniversary, I traveled the same path, starting at the graves of the first Vavaks to come to Nebraska and traveling along US Highway 30 to Grand Island. Here is what I wrote after that first day..
Today was the first day of my yet-to-be-titled photographic foray into the state of Nebraska. The whole project is still up in the air as of now, but I'm sure it'll eventually take shape over the next few months. This will mark the first project that I will reveal as a whole in some way, hopefully in a gallery or other space, rather than showing an image here and there in this journal. I hope to have at least 50 solid images by the time the whole thing is done. After today, it feels very possible, if I can put a finger on exactly what it is I'm trying to do. The end result was a multi-year project featuring one photograph for each of Nebraska's 93 counties. And my first solo exhibition, and my first self-published photo book. Looking back at the pictures from that first day, there are a lot of misses, but there are also a few solid images that made the final draft and are still among my favorite photographs. I've compiled twelve pairs of images showing what has (and hasn't) changed between 2007 and 2017. The first six are posted below with the rest to follow later this week. The blue dots represent places I've visited, from towns to natural areas to cemeteries to state-lines and more. The red dots (of which 16 remain!) are the few towns I've yet to visit in my travels. As with the ninety-three project, it would have been a heckuva lot easier if this is what I had planned from the beginning. Despite that, it's been a fun journey and I'm looking forward to completing this personal challenge in the next year or so. All that remain: Amelia, Brownlee, Chambers, Champion, Cummingsville, Elsmere, Huntley, Johnstown, Lamar, Lebanon, Milburn, Milligan, Naponee, Palisade, Purdum, and Wood Lake. This was my first visit to the Olson Nature Preserve near Petersburg, a small, semi-remote public nature reserve along Beaver Creek. It's one of the more fascinating natural places I've found in the state. The area around the creek is a wetland, with tall Cottonwood Trees and tall native prairie grasses. 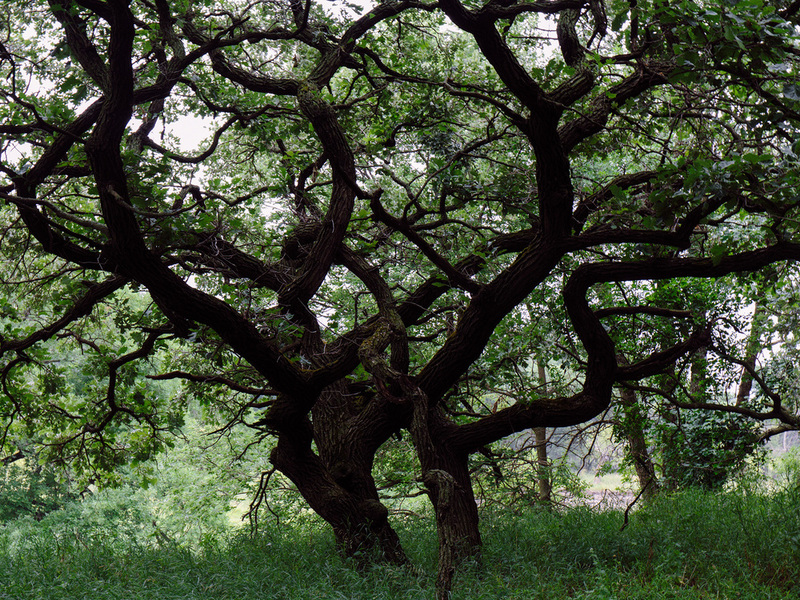 Along a ridge, there is a cool, dark woodland full of tangled old Oak trees. And on the other side of the ridge are the start of the sandhills complete with cacti and more desert-like grasses. And all of this within a mile or so walk from the parking lot. I've talked here and there in this blog about my on-going Fontenelle project. 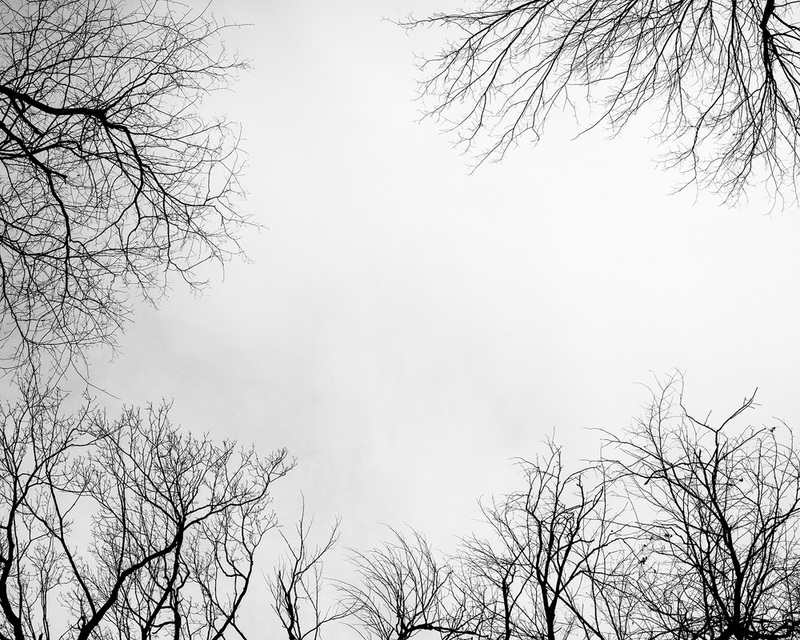 The project is a series of black-and-white photographs depicting Fontenelle Forest, a private nature reserve located in Bellevue, Nebraska that was founded in 1913. It's a documentation of a walk in the woods - landscapes and intricate details, changing seasons, and the process of getting to truly know a place. Twenty images from Fontenelle will be on display at Fontenelle Forest's Nature Center beginning on Saturday, April 11th. The Nature Center is located at 1111 Bellevue Blvd North. Visit fontenelleforest.org for more information. I wandered onto Fontenelle Forest's flood plain on a chilly Saturday morning in early October, 2012 without much of a plan other than to get out of the house for a little while. The photographs and landscape immediately resonated with me and I began the task of exploring every single mile of trail in the reserve. By the next summer, the foundation of the project was firmly in place. In a random twist of fate, I needed some volunteer hours for a class I was taking and received an email from Fontenelle Forest to its members looking for volunteers in July of 2013. Volunteering lead to an internship and a permanent communications position followed. I've now worked at the forest for over a year. The result is a series of photographs that has become very personal to me in a lot of ways. As you may notice, the subject matter is very different from everything I've done to this point. This has been both exhilarating and terrifying for me. On one hand, I feel it's very important to push ones' self artistically rather than continue to just stagnate and keep reproducing the same thing for years. On the other, I feel as if I've established a very identifiable aesthetic that has grown with time, and that aesthetic does not necessarily lend itself to a large series of natural subjects. In the end, I've sided with growth and feel as if the challenge and experience of making Fontenelle has changed both me and my work for the better. Planning and creating the exhibition has been very rewarding as well. I've been digitally printing black and white for the first time and really love the results. Everything has been done using archival materials, from the pigment inks and Hahnemuhle FineArt Baryta paper to the mat board and mounting materials. All photographs will be available in two sizes: 12x15" matted to 16x20" and 8x10" matted to 11x14" (smaller prints on Ilford paper). Pricing will be determined soon. I'm excited to share this creation with the world and hope everyone gets a chance to see the exhibition. We'll have a small artist's reception in the coming week as well. 2014 was a very important year in my life. I married my amazing wife in October and spent much of the year acclimating myself to a new career. It was a year of growth and change, of new beginnings and developing ideas, and it seemed to pass almost before I fully realized it was even here. Photographically speaking, it was not my most productive year. I spent much of the second half preparing for a wedding and getting more involved in my job, and I struggled a bit with the concept of what to do next with my work. This struggle is a common issue for anyone in a creative endeavor, and I've found myself stuck many times over the almost-decade that I've been working on my various projects. In fact, the very mention of an "almost-decade" passing makes me wonder exactly what I've been up to all this time. It's not difficult to see some sort of progress in my photographs but I often feel like I've been standing far too still. The answer to all of this artistic uncertainty? Work harder, continue to find inspiration, and find as much time as I possibly can to get out in the world and explore. Two of my long-term projects are finished and ready to see the light of day. Fontenelle - This photographic exploration of Fontenelle Forest in Bellevue, Nebraska will be exhibited this year at the Forest's Nature Center. I'm still toying with the idea of a book, but have not yet been satisfied with the black and white printing available at a more reasonable price. This is work that I'm very excited to share with everyone as it is such a big departure from everything I've worked on to this point. It's a project about a walk in the woods, exploring everything around, and finding something interesting in even the smallest details. Untitled Loess Hills Project - I've decided that this Western Iowa project is now done, at least the photography part of it. Next up is to find a title and look for a way to exhibit as many of the images as possible. 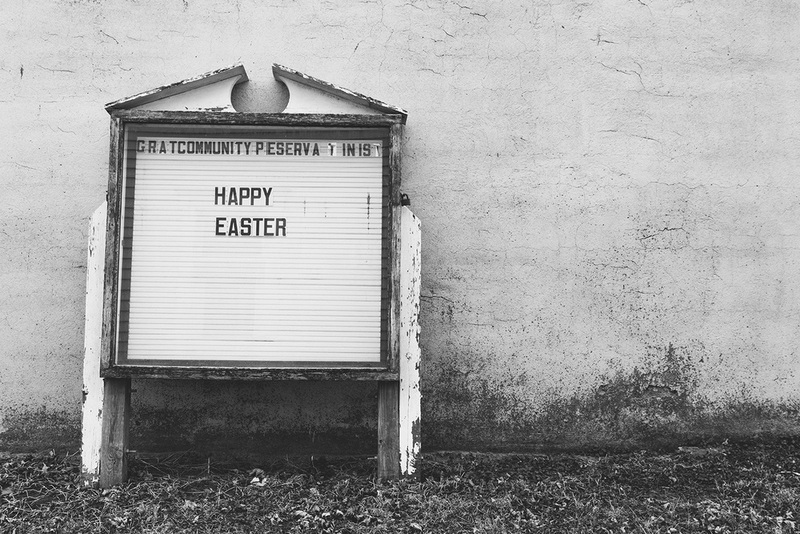 This is a black and white project that I've been working with off and on for quite a few years, wandering down nearly every road and into every town I can find. Exhibit more often. This begins with a few photographs from ninety-three on display at the Young Professionals Summit in Omaha on March 5. Begin to look for new ways to fund both the making and exhibition of work. Start something entirely new and finish at least one idea that I have been working on. Thank you to everyone for your interest and support. I look forward to showing you more of what I've been working this year.